And in 1954, Townes and his follower James Gordon succeeded at the first amplification and creation of electromagnetic waves based on stimulated emission from the ammonia MASER, the first device constructed based on Einstein’s predictions. 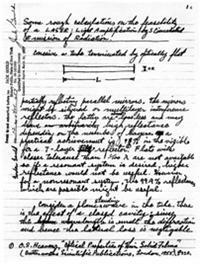 The following image is the first page of Gordon Gould’s famous notebook, where he created the acronym LASER and explained the essential elements for its formation. On May 16, 1960, Theodore H. Maiman, a physicist at Hughes Research Laboratories in Malibu, California, created the first laser by using a synthetic ruby cylinder, about 1 cm in diameter and 2 cm in length. He coated the ends with silver to create a reflection and made it serve as a Fabry-Perot resonator. Maiman used photographic flash lamps as the source of laser pulse. Image 2. Gordon Gould’s Notebook. In December 1960, Ali Javan, William Bennett Jr., and Donald Herriott of Bell Labs developed the first He-Ne Laser that produced a beam at 1.15 μm. In December 1961, the first medical treatment using a laser on a patient was performed by Dr. Charles J. Campbell at Columbia-Presbyterian Medical Center and Charles J. Koester of the American Optical Co. at Columbia-Presbyterian Hospital in Manhattan and the laser was used to destroy a retinal tumor. In 1962, Fred J. McClung and Hellwarth proved the laser theory by generating peak powers 100 times that of ordinary ruby lasers by using electrically switching Kerr cell shutter. The giant pulse formation technique was called Q-switching. 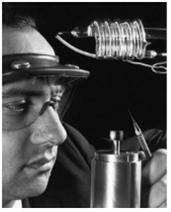 In 1964, Joseph E. Geusic and Richard G. Smith at Bell Labs invented the Nd: YAG (neodymium-doped YAG) laser, which later proved ideal for cosmetic applications such as LASIK and skin resurfacing. In 1964, Kumar Patel at Bell Labs invented the CO2 laser. Just as is true with all devices, the initial models had inferior specifications compared to the current devices and their sizes were too large. It took a considerable amount of time for the devices to become compact enough to enable easy usage. Following gradual improvements, the CO2 Laser is now used worldwide as a cutting tool in surgery and in industry. In 1966, the Dye Laser was developed by Peter P. Sorokin and John R. Lankard of the IBM’s Thomas J. Watson Research Centre. An Australian company Norseld Pty Ltd. developed the Copper-Bromide Laser for medical use in 1989 and it was introduced in Korea in 2000.